Glen Burnie, MD Sleep Apnea Dentist | Paul R. Miller, DDS | What is Sleep Apnea? Sleep apnea is a condition that can be caused by various health problems. When someone has sleep apnea, breathing stops frequently throughout the night. Breathing is essential to life; we need to breathe to release carbon dioxide and take in oxygen. When you aren’t breathing in enough oxygen, you may become dizzy or light-headed and feel out of breath. Someone who has sleep apnea can stop breathing hundreds of times in one sleep cycle. Sleep apnea has also been shown to shorten one’s lifespan because over time it can cause organ failure due to lack of oxygen. 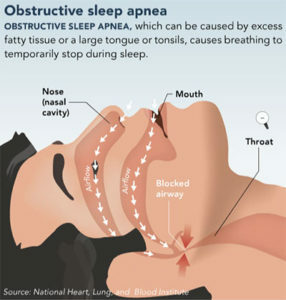 Because of this, it is important to treat your sleep apnea quickly and effectively. Contact our office to schedule an appointment with our sleep apnea dentist today.